Parking lot in East St. 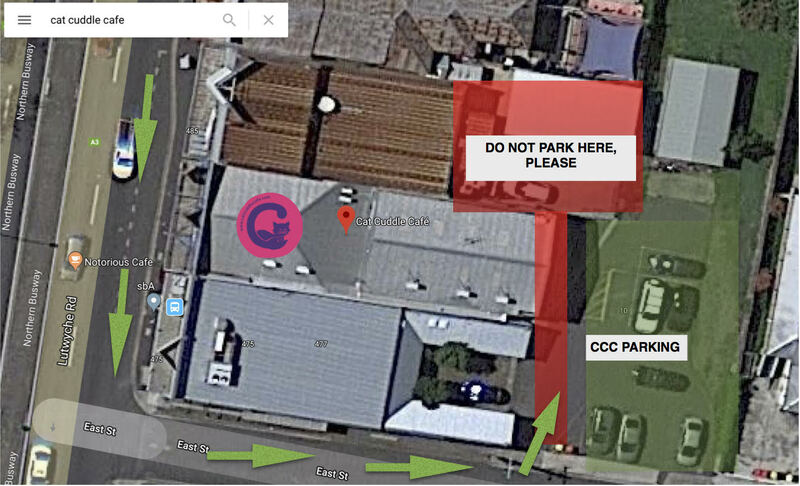 If you are booking for more than one person and the time slot you want disappears before you have finished making all of your bookings, please send an email to contact@catcuddlecafe.com or call us during business hours. Children under the age of 7 years are NOT PERMITTED inside the CAT ROOM. We truly regret that little ones cannot come into the Cat Cuddle Café cat room but we must consider the safety of the children and the cats. When booking you will have agreed to not having children under 7 years old in your party. Children under 13 years of age must be accompanied by an adult. We have limited wheelchair accessibility into the cat room via portable ramps. Large motorised wheelchairs may not be able to go down. Please call about our access. You can cancel/reschedule your booking at any time by sending an email to contact@catcuddlecafe.com, however a refund will only be provided if the cancellation email is received by us at least 48 hours prior to your booking time. The booking and handling fee of $2.00 (included in the entry price), is non refundable. 48 hours notice is also needed for rescheduling, no fee is taken for this. Dress up and have fun without supporting the cruelty of racing.